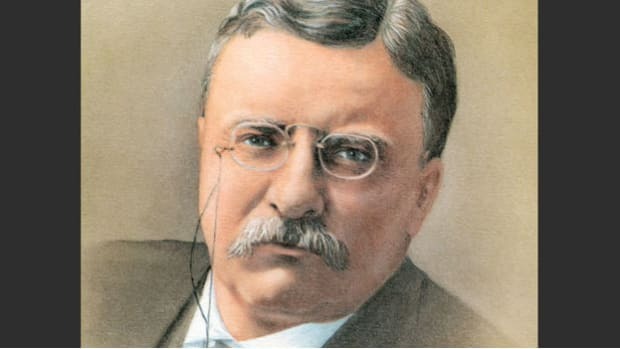 The rising young Republican politician Theodore Roosevelt unexpectedly became the 26th president of the United States in September 1901, after the assassination of William McKinley. Young and physically robust, he brought a new energy to the White House, and won a second term on his own merits in 1904. Roosevelt confronted the bitter struggle between management and labor head-on and became known as the great “trust buster” for his strenuous efforts to break up industrial combinations under the Sherman Antitrust Act. 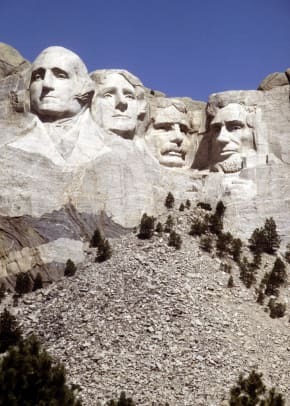 He was also a dedicated conservationist, setting aside some 200 million acres for national forests, reserves and wildlife refuges during his presidency. 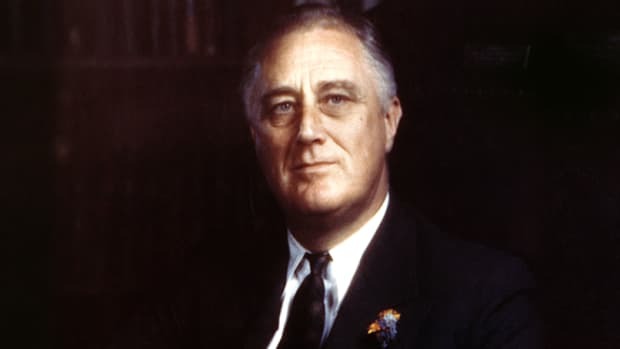 In the foreign policy arena, Roosevelt won a Nobel Peace Prize for his negotiations to end the Russo-Japanese War and spearheaded the beginning of construction on the Panama Canal. After leaving the White House and going on safari in Africa, he returned to politics in 1912, mounting a failed run for president at the head of a new Progressive Party. Theodore Roosevelt was born on October 27, 1858, into a wealthy family in New York City. Known as “Teedie”–later “Teddy”–he was frail and sickly as a boy, and as a teenager followed a program of gymnastics and weightlifting to build up his strength. Upon graduating from Harvard College in 1880, Roosevelt married Alice Hathaway Lee and entered Columbia University Law School, though he dropped out after only one year to enter public service. He was elected to the New York State Assembly at the age of 23, and served two terms (1882-84). 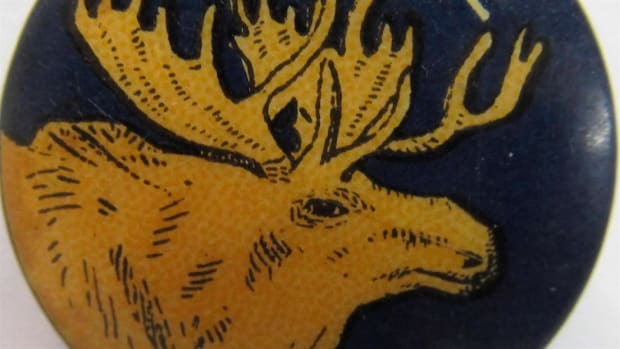 Both his wife and mother died on the same day in 1884, and the grieving Roosevelt spent the next two years on a ranch he owned in the Badlands of the Dakota Territory, where he hunted big game, drove cattle and worked as a frontier sheriff. 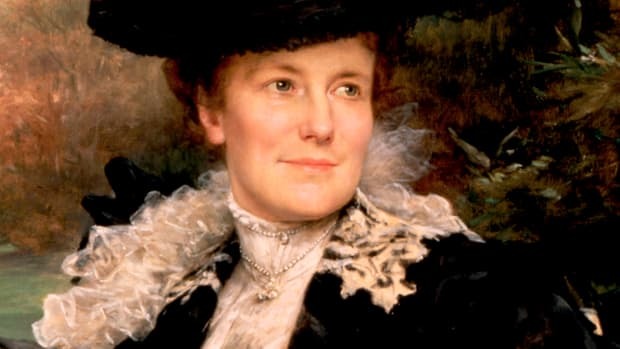 Upon returning to New York, he married his childhood sweetheart, Edith Kermit Carow. 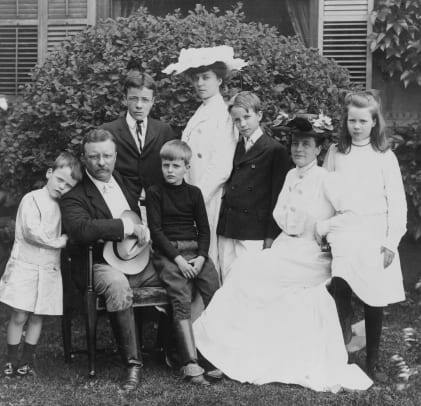 The couple would raise six children, including Roosevelt’s daughter from his first marriage, Alice. Did you know? Early in his presidency, Theodore Roosevelt sparked a scandal when he invited the African-American educator Booker T. Washington to dine with him and his family; he was the first president ever to entertain a black man in the White House. In 1886, Roosevelt ran unsuccessfully for mayor of New York City. Two years later, President Benjamin Harrison rewarded Roosevelt’s service to the Republican Party with a job on the U.S. Civil Service Commission; he was reappointed by Harrison’s successor, Grover Cleveland. 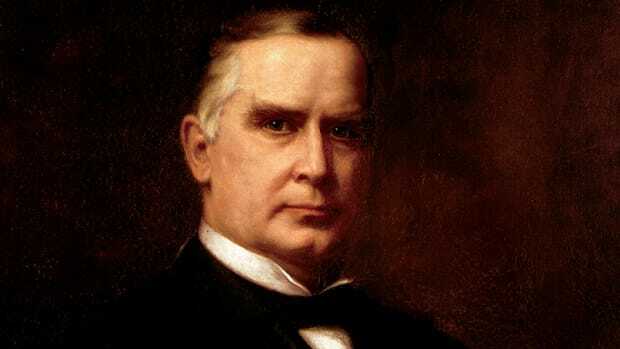 In 1895, Roosevelt became president of the New York City Board of Police Commissioners, and in 1897 William McKinley named him as assistant secretary of the U.S. Navy. Upon the outbreak of the Spanish-American War in 1898, Roosevelt left his post as naval secretary to become colonel of the First U.S. Volunteer Cavalry, known as the “Rough Riders.” Once in Cuba, Roosevelt led the Rough Riders in a brave, costly uphill charge in the Battle of San Juan; he returned home as one of the war’s most visible heroes. The Republican political machine in New York threw their considerable support behind the returning war hero, helping Roosevelt defeat a popular Democratic candidate to win the governorship. Once elected, Roosevelt displayed his characteristic independence and unwillingness to buckle to the pressure of party bosses. In 1900, the leading New York Republican Thomas C. Platt conspired with national party boss Mark Hanna to get Roosevelt named as McKinley’s running mate, in order to keep him from running for a second term in the governor’s office. Roosevelt campaigned vigorously for McKinley, traveling by train for more than 21,000 miles to speak in 24 states, and McKinley and Roosevelt won in a landslide over Democrats William Jennings Bryan and Adlai E. Stevenson. On September 6, 1901, a deranged anarchist named Leon Czolgosz shot McKinley at the Pan-American Exposition in Buffalo, New York. McKinley died eight days later, and Roosevelt was sworn in as the 26th president. Only 42 years old when he took office, he was the youngest president in the nation’s history, and his youth and vigor immediately transformed the public image of the presidency. From the time of his First Annual Message to Congress in December 1901, Roosevelt expressed the progressive belief that government should mediate between conflicting forces (including capital and labor, isolationism and expansionism and conservation and development) in order to stabilize American society. Roosevelt’s “Square Deal” domestic program included a promise to battle large industrial combinations, or trusts, which threatened to restrain trade. In 1902, his government brought a successful suit under the previously ineffective Sherman Antitrust Act against the Northern Securities Company, a railroad combination formed by James J. Hill, E.H. Harriman and J.P. Morgan. That same year, he intervened in a prolonged coal strike in Pennsylvania, using a combination of negotiation tactics to halt the strike and gain a modest pay increase for the miners. Roosevelt also used his executive power to further his passion for conservationism. In June 1902, the National Reclamation Act (dedicated to large-scale irrigation projects in the American West) became the first major legislative achievement of his presidency. In addition, Roosevelt set aside almost 200 million acres–almost five times as much land as all his predecessors combined–for national forests, reserves and wildlife refuges. Despite his progressivism and his reputation as a “trust buster,” Roosevelt was able to amass the support of more conservative Republicans and business interests and win a landslide victory over the Democrats in 1904. He was the first president to win reelection after gaining the White House due to the death of his predecessor. Like McKinley, Roosevelt sought to bring the United States out of its isolationism and fulfill its responsibility as a world power. He believed that America should “speak softly and carry a big stick” in the realm of international affairs and that its president should be willing to use force to back up his diplomatic negotiations. 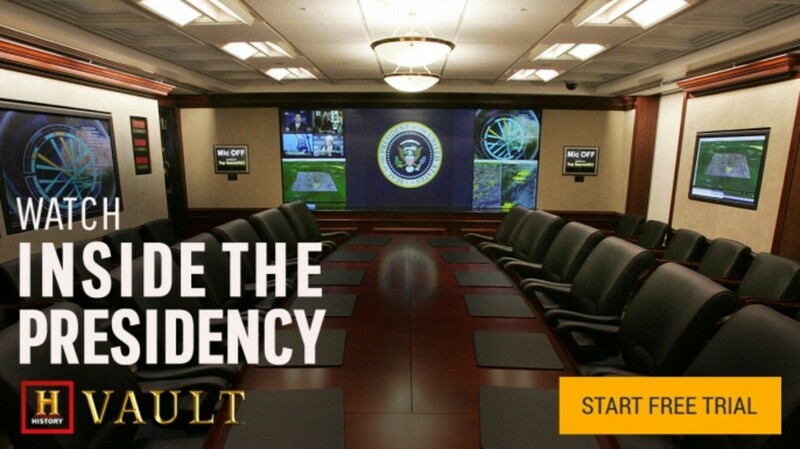 Roosevelt followed this big-stick policy most conspicuously in his dealings in Latin America. In 1903, he helped Panama secede from Colombia in order to facilitate the beginning of construction on the Panama Canal, which he later claimed as his greatest accomplishment as president. The following year, after several European nations had attempted to forcibly collect on debts owed to them by Latin American nations, Roosevelt issued a “corollary” to the Monroe Doctrine stating that the United States would bar foreign intervention in Latin America and act to police the hemisphere, ensuring that countries paid their international debts. To prepare the United States for its expanded role on the world stage, Roosevelt sought to build up the country’s defenses, and by the end of his presidency he had transformed the U.S. Navy into a major international force at sea. Outside the Western Hemisphere, he led negotiations to end the Russo-Japanese War in 1904-05, winning the Nobel Peace Prize for his efforts. He also reached an agreement with Japan that traded diplomatic recognition of that country in return for Japan’s acceptance of the ongoing U.S. presence in the Philippines. While campaigning in Milwaukee, Roosevelt was shot in the chest by a fanatic, but soon recovered. With the Republican Party split, Democrat Woodrow Wilson took the White House, winning 435 electoral votes to Roosevelt’s 88 (Taft received only eight). Despite the loss, Roosevelt’s run marked the most successful third-party effort in American history, and many of Wilson’s progressive reforms over the next eight years would echo Roosevelt’s 1912 platform. Roosevelt was an early advocate of American entry into World War I, which broke out in Europe in 1914, and strongly criticized Wilson’s early policy of neutrality. Once the United States entered the war in 1917, all four of Roosevelt’s sons volunteered to fight; his beloved youngest son, Quentin, was shot down and killed while flying a mission over Germany. Politically and physically active until the end, Roosevelt died in his sleep on January 6, 1919, at his family home in Oyster Bay, New York, at the age of 60.